Gun control becomes only one part of the larger solution to violence in our communities. The students of Marjory Stoneman Douglas High School have catalyzed a social movement demanding an end to gun violence. While their leadership and moral authority have undoubtedly taken the movement to another level, youth-led activism against gun violence is not, in fact, new. In Florida in 2013, for example, members of Power U and Dream Defenders took over the state capitol to protest the “stand your ground” laws that allowed Trayvon Martin’s killer to go free, an event that helped give rise to the Black Lives Matter movement. Organizations led by young people of color have been working to end violence in their schools and on their streets for years, even decades. While some adults are focusing on the divisions between these constituencies, the young organizers themselves are finding common cause. Student leaders from Parkland have taken the time to listen and learn from their black and brown peers. Two weeks after the shooting, they joined Miami youth in a meeting organized by Power U and Dream Defenders to explore an alignment in their struggles. Similar meetings have taken place with young people from Chicago, Los Angeles, and other cities. The Parkland students have also explicitly acknowledged that their activism is getting more attention in the media than other protests against gun violence, including violence by police, and they have shown a remarkable commitment to using their platform to amplify the voices of black and brown young people. 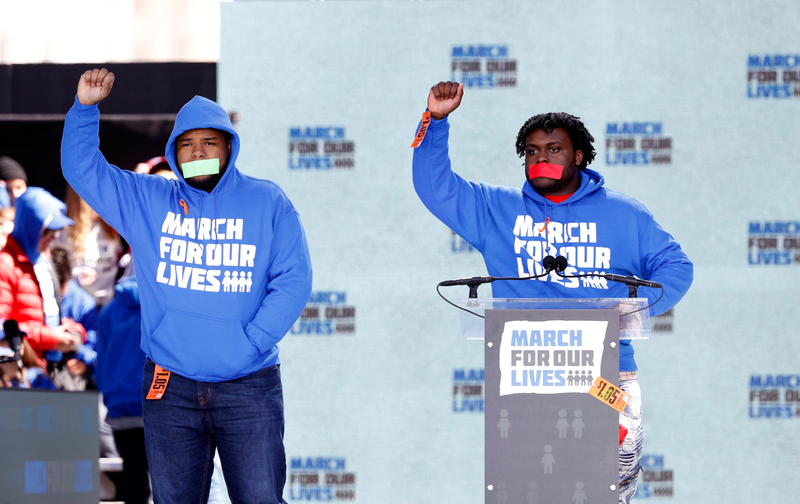 They invited, for example, activists of color like Alex King, D’Angelo McDade, Edna Chavez, Naomi Wadler, and others to share the stage at the March for Our Lives in Washington, making it impossible for the national media to ignore these powerful voices. Chavez, a member of Community Coalition in South Los Angeles, condemned zero-tolerance policies and armed officers in schools, saying, “Instead of making black and brown students feel safe, they continue to profile and criminalize us.” The data confirms her experience. Students in a school with police on campus are nearly five times more likely to be arrested for disorderly conduct than students in schools without police. High schools with mostly black and brown students are the most likely to have law-enforcement officials on campus. Unsurprisingly, black students are 2.3 times more likely to be referred to law enforcement or arrested in school than their white peers. The trend to “harden the target” by adding metal detectors, surveillance, and armed police in schools began after the Columbine massacre in 1999 and increased after Sandy Hook. This “hardening” has not resulted in more arrests for gun-related offenses in schools. But it has increased school arrests for minor infractions—by 71 percent in Denver public schools between 2000 and 2004, for example—mostly for normal childish and adolescent behavior that used to be handled by school staff. Ignoring this evidence, federal and state legislatures are once again pushing for even more police and surveillance in schools. Organizations led by youth of color have been fighting against these policies for years—and they are only now getting a fraction of the attention they deserve. In May 2016, for example, students reported that a police officer in school punched a student, threw him to the ground, and put him in a headlock. Even though part of the incident was captured on video, the officer was transferred, but not disciplined. Members of the Philadelphia Student Union demanded and won a groundbreaking school-police complaint system, similar to a civilian-complaint review board. In New York City, members of Make the Road New York are fighting to remove police from schools and reallocate the funds to restorative practices, mental-health services, and other student support. The city’s schools are among the most racially segregated in the country, and there are nearly twice as many police as counselors in schools there. In 2013, only 13 percent of black and Latino students graduated from high school prepared for college. Make the Road New York has created a peer-driven model for college advising and conflict resolution to enhance both safety and college readiness. Young people are calling for a redefinition of safety that acknowledges the root causes of their struggles and confronts the fears and trauma of their lives with mental-health support, restorative practices, and caring adults who will nourish and cherish them. As adults, we should emulate the students from Parkland. We too must take the time to learn from young people who have lived with the trauma of violence for years.